New app for Android 4.0 Ice cream Sandwich launched which is called Facelock. This new app is really interesting for Android users. 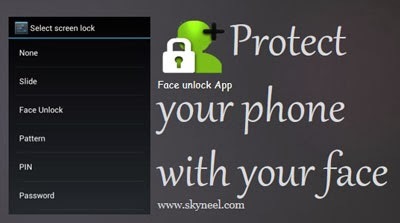 In this app user can create lock using their face for their smartphone. In your smartphone your facial recognition will be used to unlock your phone. It replace the simple touch lock to some interesting locking system. This app is created by SmartApps Mobile. This app allows user to use their face as key to unlock their smartphone. For this user need not to use front camera, instead of it user can use rear camera of their mobile. This app is designed for users to bring facial recognition to expand features for smartphones. It is an attempt to make face use popular and make it simple and useful experience. Through this app you can unlock your phone by using your facial recognition.You can use this face lock to unlock any specific application also. To launch this app on your smartphone first download this app from Google play Click Here . To access Facelock on your phone go to its main menu, where you will find the option customize the app’s performance. To enable this app on your mobile tap the Enable Face Lock button which you can find in main menu. By doing this, this app will be active on your mobile. This app allows user to click his picture and train this app identify its owner. For the training of identification of owner, user have to tap Train face recognition button. For this user have to click minimum 7 picture of his from different angles and lighting conditions. You can change your look also in all these pictures like photo in goggles, photo with bread, smiling face etc. If phone doesn’t recognize its owner If user active this app on his smartphone and this app failed to recognize its owner, then there is plan B also to unlock your phone. In this condition this app will ask user to type the PIN, Password or Pattern based unlock key. User can set password or PIN. For this user have to go to main menu, tap Set password / PIN. By using this app you can also protect the Settings, Task Manager, and Google Play on your phone. Whenever you access all these this app will kick in. You can also use this app to unlock any specific application also.